Line 8-inch square pan with foil, leaving foil overhanging at 2 opposite sides of pan; spray foil with cooking spray. In large microwavable bowl, microwave white vanilla baking chips uncovered on High 1 minute. Spoon frosting over chips. Microwave uncovered on High 30 seconds; stir. If necessary, continue to microwave in 15-second increments until mixture can be stirred smooth. Stir in peppermint extract. Place 1/2 cup fudge mixture into small bowl; tint red by stirring in food color to desired color. Spread untinted fudge mixture into pan. Drop heaping tablespoons of red fudge mixture in pan to create random pattern. Pull table knife through layers for marbled design. Sprinkle crushed candies over top. Refrigerate uncovered until set, about 1 hour. Remove from pan by lifting foil; peel foil away. Using sharp knife, cut into 8 rows by 8 rows, cleaning knife blade after each cut. Store covered in refrigerator. 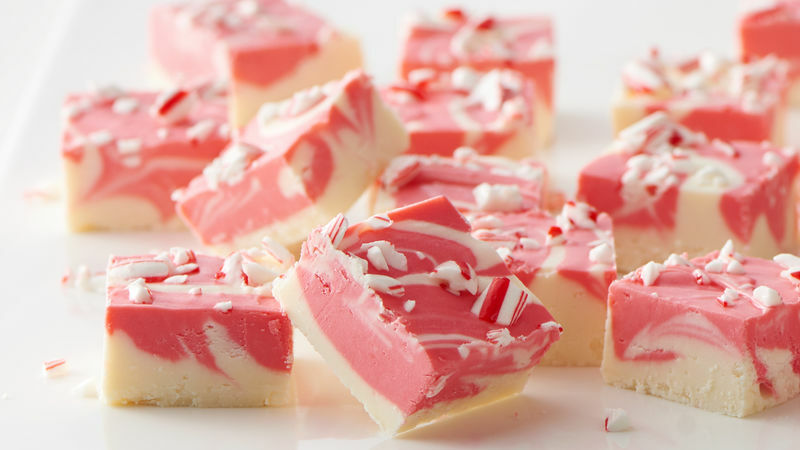 To easily crush peppermint candy canes, place unwrapped candy canes in resealable food-storage plastic bag; seal, and use rolling pin to coarsely crush. Microwave ovens vary, so carefully watch to avoid burning or overcooking the fudge mixture.